The raku process leaves its mark on the clay as no other firing method does. When the piece comes out of the kiln at about 1750 degrees F, it is put into sawdust, which immediately ignites. This after burn leaves its mark reminding me of the celestial fires that produced our plant and all of the heaven's wonders. Here is a vessel that bares the marks of such an after burn. 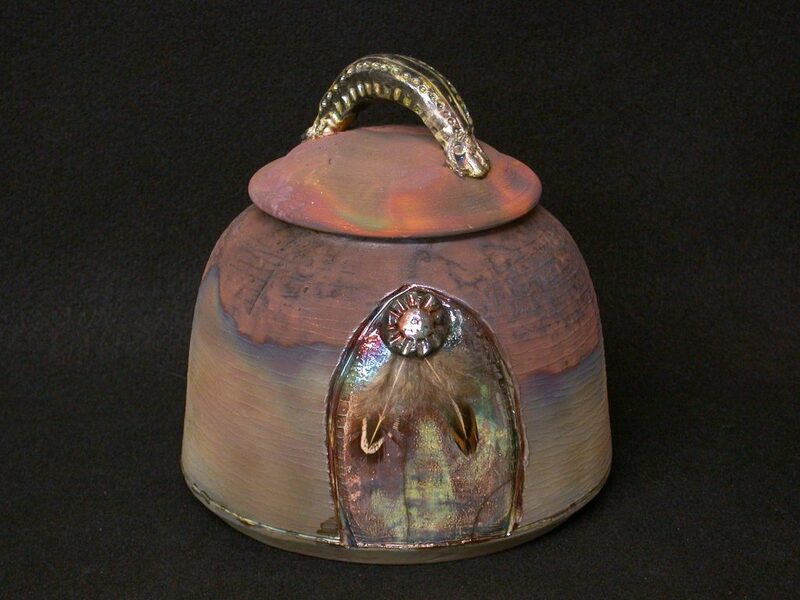 I added a handle to its lid reminiscent of a living creature, applied shiny glaze to it and the side patterns, then to complete the ancient look I added feathers similar to what our early ancestors would have used. Size: 8" ht x 8" dia.